For Christine Anderson, Gold’s Gym was the starting point to her best self. There was a time when Christine Anderson wouldn’t go near a gym. She lost control of her eating, struggled to climb a flight of stairs and hated the way she looked. That’s what anxiety can do to a person. Christine, 24, has battled it for almost a decade, and the fight continues. But after willing herself to change and developing a special bond with a Gold’s Gym trainer, she sees hope. That’s remarkable progress when you consider that for the longest time, all she felt was shame. Her anxiety led to depression. Christine had played softball until high school, but the pressure she felt caused her to stop all physical activity. Other parts of her life suffered, too. Christine’s anxiety crept into her romantic life, and she began to put on weight. Once, she says, her boyfriend didn’t want to take her to a party because she was heavy. To deal with the hurt, “I would eat and keep eating,” she says. In high school, Christine weighed about 160 pounds. Two years after, she was pushing 200. She has almost no photos of herself from around that time. She hated having her picture taken. Finally, after years of frustration, she decided it was time to make a change. “I wanted to love both my body and myself again,” she says. 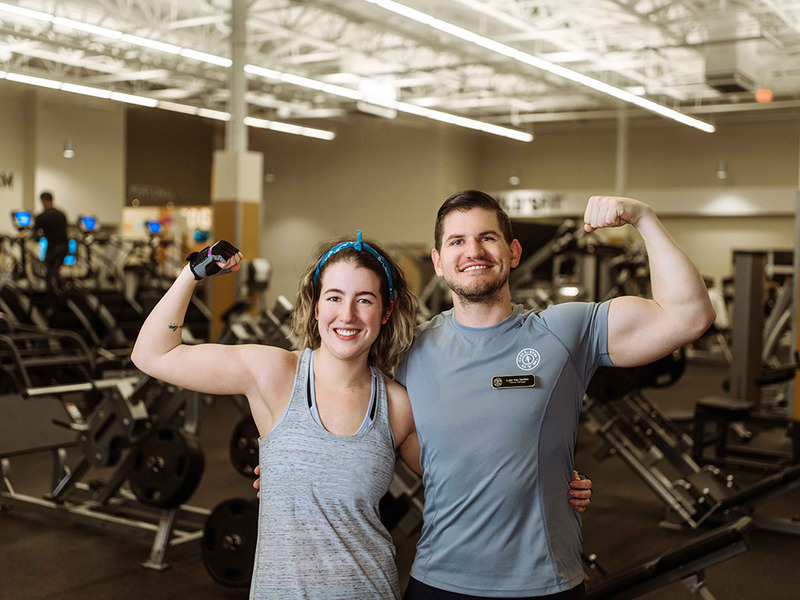 About a year ago, Christine found a Gold’s Gym in San Antonio and began training with Luke Van Delden twice a week. They did primarily resistance training with some cardio. After a few months, Christine realized she needed to train harder and change the way she ate. She started coming in on days when she wasn’t training with Luke, and she enrolled in GOLD’S FIT® classes. Over time, she began to feel more assured in in her ability to perform at that high level and formed bonds with her classmates. She also began training three times a week with Luke. Together, they continued focusing on getting her toned through resistance training with both weights and machines. They also worked together to establish eating habits that would stick. Christine still deals with anxiety and depression, but she’s getting better at coping with them. “I believe the gym has definitely helped,” she says. “When I go, I feel like all my problems are left at the door, because when I’m there, the only thing I’m focused on is me. I’m there to help myself be better and do better, and none of those problems are going to get in my way. Luke sees Christine as more self-assured now and more likely to advocate for herself outside the gym. “I think she has a lot more confidence in herself,” he says. “There’s something to be said about investing in yourself. Whether it’s time or money, putting resources into your own personal well-being makes you feel like you are worth more — more deserving of love, respect and happiness in general. “Not only does exercise help you build muscle, lose fat and increase your energy, it also helps you feel better by releasing endorphins,” he adds. Today, Christine is better about recognizing her self-worth, and she’s grateful for the support she’s getting from her parents. “It feels really good to do all this work and have them say they’re proud of me,” she says. She’s convinced them to let her follow her own path. Now, she just wants to get them to the gym, too.